Distribution of products by 2000 Flushes, a WD-40 Company, to Participating Parties (media, bloggers, or other third parties or individuals) for the purpose of review and/or endorsement are done so in faith that the Participating Parties will be in compliance with FEDERAL TRADE COMMISSION 16 CFR Part 255 Guides Concerning the Use of Endorsements and Testimonials in Advertising and other related regulations, applicable statutes, regulations, or requirements of any government authority as they relate to subsequent posts or promotional material featuring 2000 Flushes or any of its products resulting from distribution by 2000 Flushes. Super Bowl Sunday is on February 7 this year. That is only sixteen days away. Did you know that no NFL team has ever played the Super Bowl on it’s own home field? Here are a few more fun facts about the Super Bowl. The Green Bay Packers were the first team to win 2 Super Bowls. The first took place in 1967 and the second one was a year later in 1968. No NFL team has ever played the Super Bowl on it’s home field. Tailgating dates back to the first college football game between Rutgers and Princeton in 1869, when fans traveled to the game by carriage, grilling sausages and burgers at the “tail end” of the horse. The biggest regular tailgate party is for the Florida-Georgia game in Jacksonville. Attendees call it the world’s largest cocktail party. Fans begin arriving on Wednesday for a Saturday game and sometimes keep raging until Sunday afternoon. 35% of the people attending the game write it off as a corporate expense. More drivers are involved in alcohol-related accidents on Super Bowl Sunday than any other day of the year (except St. Patrick’s Day) according to the Insurance Information Institute. The average number of people attending a Super Bowl party is 17. 8 million pounds of guacamole is consumed annually on Super Bowl Sunday. 14,500 tons of chips are served with this guacamole. Super Bowl Sunday is one of the busiest days of the year for toilets. 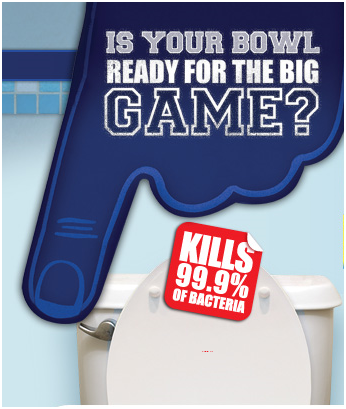 90 million toilets will be flushed during half time. To celebrate Super Bowl Sunday, 2000 Flushes is holding a Sweepstakes. You can Enter to Win the grand prize of a $10,000 bathroom makeover/remodel. They are also giving away 99 weekly prizes of free product. You can also get a $1.00 off coupon from their website. Hilarious facts! I feel so educated right now.